Tribute painting to Steve Irwin by Jason Swain. Steve Irwin with his 'infectious' smile. You are so awesome hero. dear steve irwin,,we all miss you greatly..no matter what you will always be in our hearts forver..i was hoping to come to your zoo oneday but i still am..hope bindi and your family are safe and cared for...i love you steve irwin and bindi and terri and little bob! Steve irwin was probly the greatest person to walk the earth. The way he handled these animals and what he would do to help them were amazing. Like how he loved a snake that had proble killed many people before he just loved them like they were a child witch i find hard but to him it was lerning to exept them for what they are and what they did. STEVE IRWIN WAS A GREAT MAN HE WAS A ANIMAL LOVER HE LOVED CROCS ESPECIALLY STEVE WAS SUCH A GREAT MAN I FEEL BAD FOR BINDI AND TERRI MAY HE REST IN PEACE AND MAY WE ALWAYS REMEMBER HIM. Steave you were always my hero, I remember when I was little said I was going to marry you, haha. My dream was to meet you and work at Australia Zoo. I had dreams of meeting you and I woke up crying because I was so happy. All I can do now is carry on your work and help to save this world, you will never be forgoten, and you have touched many lives. Rest in adventure. people have super heros like batman, spiderman and so on but you were my super hero...the way you were with animals exspecailly crocs, was just magic to me...you did great things for the animals and i am proud to have you as an australian representative.. R.I.P Steve...may the croc hunter live on..
My name is Rachel and I love watching the Crocodile Hunter.PEACE TO YOU MATE! I will always remeber you this way. Always happy and smiling. You are missed greatly. You are one memorable block steve. Memorable for jumping off cliffs memorable for when you would jump 20ft backwards to avoid Agro and Cookie, just all around memorable. I will always watch your shows and i'm sure a tear or two will come but i will remeber that you are happy in your new home. God wanted you now he set you free. My dream was to work with you but now i have the chance to work with Bindi. Your daughter is one lucky girl to have a dad like you. My thoughts and every prayer are with Terri and the kids. We love you mate. Love Always your #1 Fan!! The Crocs weep for you mate!!! I couldn't believe it when I heard the infamous, all around hero of wildlife, Steve Irwin, passed away. He was an idol of mine growing up. 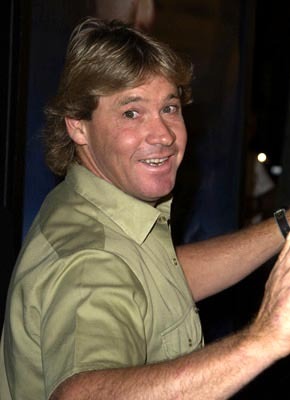 Every single day I would catch his show, The Crocodile Hunter, on Animal Planet. I would sit in awe infront of the T.V watching him perform these wonderful acts of kindness for the wildlife. I am 15 now and still watch his show from time to time. It never gets old, and the show always brings a smile to your face. Steve was a hero to many and will never be forgotten. I hope someone someday follows in his footsteps, but there will never be anyone with as much enthusiasm or character as Steve Irwin The Crocodile Hunter. We all miss you Steve; you were my hero, and always will be. We all loved u ! Ana Rey, fort lauerdale FL. Steve-O, your work and passion for life will never be forgotten...you will live on through your children, your Zoo, and all the hours of film (your passions with Animals, Sufring, etc.) that remain. I know your family will never let your work on this planet cease. You will be in my mind, Steve. I admired you since I first saw you on TV. You gave animals that always frightned people, and made them stand out in the animal world. We all will miss you very much, Wildlife Warrior. My condolences to Terri and family. Ő volt a Wildlife Warrior!! My condolences to Terri and children. Steve will always be remembered and cherished in our hearts for his warm and enthusiastic "on fire" ways in his great work of enlighten us about the great diversity in our natural world. Gods blessing! love and Kind regards! you are and always will be my idol. Seriously, mate i've said it before and i'll say it again... Crocs rule! my name is matthew. i am 8 years old. i love watching the crokodile hunter. i will grow up to be just like you steve. i am sorry.